The treatment of prostate cancer has been uncertain for some time. 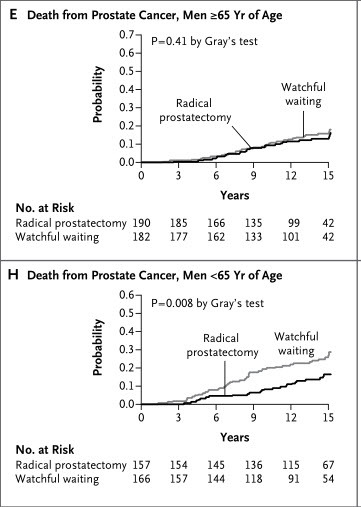 A paper in the May 5th issue of the New England Journal of Medicine examines two approaches to the disease – watchful waiting versus radical prostatectomy. A Scandinavian group observed 695 men with early prostate cancer for 15 years. They conclude that Radical prostatectomy was associated with a reduction in the rate of death from prostate cancer. The benefit of aggressive treatment, however was only seen in men under the age of 65. See figure below. This finding has important implications that go beyond treatment. At first glance it would appear that these data would support PSA screening, but Matthew R. Smith of the Genitourinary Malignancies Program at the Massachusetts General Hospital Cancer Center in Boston makes the following comment in an editorial in the NEJM published in the same issue as the Scandinavian study (SPCG-4). The survival benefit with prostatectomy in men with low-risk disease is the most important new finding of SPCG-4 but may not be relevant for men with low-risk early-stage prostate cancers identified by PSA screening. In SPCG-4, the mean age of the patients was 65 years, 88% had palpable tumors, and the cancers were diagnosed by means of screening tests in only 5.2% of the patients. Among men with newly diagnosed prostate cancer in the United States, the median age is 67 years, fewer than 50% have palpable tumors, and most cancers are identified through screening tests. The lead-time bias associated with PSA screening has been estimated to be as long as 10 years. In SPCG-4, the number of men needed to treat with prostatectomy to prevent one death at 15 years was 15. The predicted number needed to treat is substantially greater for contemporary men with low-risk prostate cancers detected by PSA screening because the rates of death from prostate cancer are lower in this group. What Dr Smith is saying that most patients in the US identified as having prostate cancer belong to a group shown by the current study not to benefit from aggressive treatment and that even if the do they are at a much earlier stage in their disease. When you add the long lead time associated with early diagnosis most may been end up in the group shown not to benefit from treatment. Only 5% of the cancers in the above studywere diagnosed by PSA testing which is very different from the conditions that prevail in the US. He cites two studies now under way to specifically address whether early diagnosis with PSA testing and subsequent treatment will reduce mortality from prostate cancer. Until these studies are completed we still don’t know if PSA testing is useful in younger men.